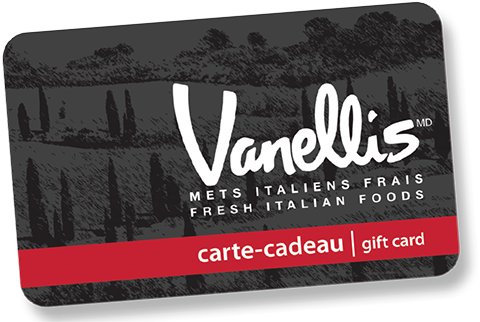 Vanellis gift cards make great gifts! Whether it’s for a friend, family, your co-workers or simply for yourself, a Vanellis gift card is always useful! Gift cards can be purchased in-store. Click here to find your nearest Vanelllis location. TRY IT – YOU’LL SIMPLY LOVE IT! Click here to register your gift card. We require your email address and to set up an account. Setting up an account allows you to track your balance, reload your card, and safeguard your card balance in case of loss or theft! Check your balance by logging into your account, or by simply clicking here! If you intend to purchase a large number of gift cards for your organization, you can contact us at the following e-mail address: giftcardsales@mtygroup.com.